Join us this month as we talk to GM DamienMaster aka artist Damien Holder to talk to him about his game Star Wars: Rogue Traders! This truly uniqe campaign has a lot of character, in more ways than one. Check out our interview below! First off, feel free to tell us about the man behind the GM screen. What do you do aside from gaming? Alter Ego’s? As Betty White would say: are you on the twitters? I’m a 30 year veteran of role-playing, living out of the Brunx, Melbourne Australia with my wife and two kids. Professionally I’m a graphic artist with a background in video game development. Personally I’m a Star Wars nut (of course), toy hoarder, comic aficionado, cult T.V. fan, movie buff, iced coffee connoisseur and all round good geek. Roleplaying has been a rewarding and dominating force in my life since a baby-sitter ran me through ‘Keep on the Borderlands’. You can check out my webfolio here. Tell us about Star Wars: Rogue Traders in a nutshell. You’ve put a lot of work into your wiki, and from what I gather – a boatload of custom artwork. How much time have you put into this stuff, and are you enjoying yourself? I find working on my campaign very therapeutic; it’s kind of a hobby within a hobby (like knitting)… Like all GMs, I toil away on stories, characters, locations, house rules and background information and it’s satisfying to record all that where it’s accessible to the whole group. Whilst still a work in progress I hope to create a wiki that’s useful to anyone running a similar game and bigger plans to publish it in some sort of playable form… It’s a big commitment but I really enjoy the process. As for the art? That IS a blast(er). I’m a professional graphic artist but Rogue Traders has been an opportunity to have a bit of fun on the side, creating Star Wars inspired artwork. Fun? Hell’s yeah! I always start a campaign by illustrating the PCs and designing character sheets, but I wanted to do more. With Rogue Trader’s massive ensemble cast, I thought it would also be useful for my players to put a face to names and hopefully create a deeper connection with them. Interestingly, the personalities and even bios of my NPCs often develop or change after I’ve finished their portraits. Then, as these amazing journals started rolling in, I thought ‘people might actually read this stuff’ and was inspired to start portraying the game sessions. I plan to have a unique illustration for every session (obviously I still have a ways to go). I’ve seen via forums and wiki that you have some interesting ways to entice players to be active on OP. Tell us about them. Well, I give most of the credit to my players… One of the reasons I started an OP campaign was to immortalise the (often ridiculously) detailed session notes many were keeping. I ask my group (collectively) to contribute one journal entry each session which importantly, is written in their character’s voice and from their unique perspective. I actually think that is key to why our log is such a fun read and, also surprisingly why the narrative is so clear. So far we have at least one journal entry for every session and I’m very proud of their contribution! For my part I offer a simple, tangible reward for any Journal or wiki entry, specifically a “Destiny Point” (essentially a bonus dice) valid for one session only. When the players stepped up to the challenge, I in turn upped the ante, expanding the usefulness of the Destiny Point as both recognition of their amazing efforts and a further incentive to contribute… And so the journal entries increased! I had a recent rant on the forums (which I have now included on our wiki here but I can summarise my tips for enticing player involvement (if my crew disagree after reading this I’ll let you know) Inspire by example. Be realistic and clear about your expectations. Be persistent and consistent about your reminders without being pushy. Be understanding and patient. Applaud their efforts, and foster friendly competition. Most importantly, offer a commensurate reward that will motivate them to participate AND build incentives into your site to encourage them to read it. A good example is that I have included basic Bios for all my NPCs and organisations; players who take the time to read through might find ways to better interact with them! Rogue Traders is a year old… The ‘group’ has been around for more than ten with a roster that has evolved over time, resulting in our current line-up; which I can honestly say is the best group I’ve ever gamed with! Xandoxan and Shortmeister have been my loyal companions from the beginning; Kanhead is on his second campaign and Bort enjoys his first tabletop experience ever (though our latest crewmen stepped in like veterans!). We treat our game night like a social sport, playing weekly, usually for 3-5 hours. 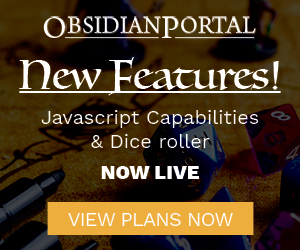 It’s one of those rare groups of like minded friends where everyone is on the same path as a roleplayer, it makes for easy GMing and a lot of fun all round. D6 Star Wars eh? Nice choice, what in particular draws you to this system aside from the obvious “Star Wars” tag? What are some of your other favorite systems? I generally upgrade my game systems but after trying SWD20 and SWSaga (which should’ve been D&amp;D 4E) there really is no substitute for WEGD6 when it comes to encapsulating the spirit of the Star Wars universe. Its writers and designers really ‘got’ Star Wars and it shows in the material. I always return to D&amp;D (Basic through to 4E and sideways to Pathfinder) but my other baby is Deadlands; I’m a western junky and Deadlands is a genre faithful, visceral system, with plenty of meat in its fluff. Overall though I like variety, we tend to alternate systems and genres and it’s less about the system for me than it is the GM and how much they ‘get’ the setting. I see you’ve gotten a lot of use out of the items tab, how does it help your game? Primarily I use OP as a repository and focal point for campaign notes, house-rules and NPC profiles. Particularly for SWD6 which is a sourcebook paradise (and therefore a reference maze) it helps to consolidate rules and information that is spread out over multiple volumes. Whenever a player expresses interest in a new hydrospanner (or I come across an item I think might be handy in later adventures) I record it in the items tab for later reference. Likewise when a new item is purchased or found, I publish it for easy access in the heat of battle. The item tab (like the rest of OP) is a one stop reference point for information in my game. That galaxy map is absolutely mind blowing, are you truly prepared for your players to zip around anywhere in that massive space? That seems like the GM equivalent of being a master ninja or something! With Wookipedia and the SWD6 Fanbooks (one of the best SWD6 resources you’ll find) bookmarked on my Kindle Fire (and a pair of brass D6s) I’m ready for anything! Whilst that is true, basically I think I keep them too busy (and hopefully interested) to put a pin in the map and hit the spacelanes (until they read this that is!). The backdrop for Rogue Traders is a privately owned space station called ‘The Eye’. Acting as a base of operations this centre of trade has its own cast of characters and overlapping story arcs, some planned, others actually developing out of the player’s interests and actions. Then there’s the missions; ‘simple’ cargo runs which inevitably become more complicated (hopefully fun) and infinitely more interesting! And the character’s background stories… Added to that I have no predetermined outcome for any of these events, the players tackle each challenge however they choose and their success or failure affects all the other events that follow or cross over with it. Who’s got time for a holiday?! Bort: Meeting new and interesting people, locations, and planets, not knowing exactly what’s waiting for us there, realising it probably wants to kill us, but remaining determined to get my crew through. Eating like a Wookie is pretty boss too! Xandoxan: The confrontation with the Banshee Crew (Sessions 25-27), some of us learned hubris, some of us were shot into unconsciousness. Shortmeister: Finally getting my sweet revenge on a pair of filthy Ubese that insulted me. What fun it was as the mercenary gang reined blow upon blow upon their heads (Session 36). Kanhead: The highlight for me has been the recurring interaction with memorable NPCs, from the manipulative Madame Khorash to the eccentric and enignmatic ‘witch’. We can always be sure that each week Damo has cooked up a challenging mission, in a unique environment and mixed in some of the fantastic NPC characters he has created. It has greatly helped to tie together the varied adventures of the crew from week to week. Players: Work with your GM. Read the rules at least once. Concept first, then character. Even heroes run, surrender and back down. Be a min-maxer but not munchkin. Keep the GM fed and watered. Run a game at least once. Take risks with your character. GMs: Work with your player. Don’t be scared to use the Rules Lawyer. An NPC is NOT a PC. Push your players and their characters. Beat your players down but let them win in the end. Help your characters to be cool. If it will make the game more fun, say yes. What a great interview! Damien’s enthusiasm is infections, no? Well everybody, that’s it for this month. Tune in next month as we highlight another amazing campaign, and remember to nominate yourself and others if you think your game is CotM material! As a long-time fan of this campaign, I must say great pick! The artwork is awesome! I love reading the character logs! I had only just discovered and favourited this campaign quite recently, it looks awesome and is a great read, I’m enjoying it very much. Cool interview. I’m gonna check out that site now. I would also like to send out a special thanks to the OP masters Micah, Ryan, and Jerry. Thanks for a great resource and for great, timely support! Please take some time to check out Rogue Traders over the next week or so and see you in the Space Lanes!